On Tuesday, Dec. 4, Stetson University will light its annual Yule Log for the 70th time. This is one of the university’s oldest traditions and is a moving, symbolic celebration. In its 70 years, it has been a favorite event for members of the Stetson community as well as DeLand residents who come to the campus to start off their holiday season. This year, the School of Music and Office of Religious and Spiritual Life will introduce several elements to commemorate this 70th Yule Log Lighting. Holiday music will feature a newly formed Stetson Community Choir. There will also be a brief video showcasing memories of Yule Logs past. Residents of Chaudoin Hall will place (battery-operated) candles in their windows, which overlook the Hulley Tower grounds on which the Yule log will be lit. This year’s Yule coincides with the 200th anniversary of “Silent Night,” the beloved Christmas carol, as well as the beginning of Hanukkah and Advent. Musical selections will commemorate these events. Several students will read stories and spiritual verses about the meaning of light in their respective faiths and cultures. 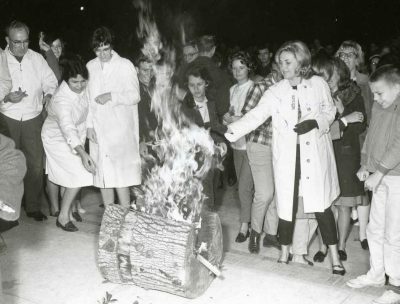 Etter Turner, Stetson dean of students, and President J. Ollie Edmunds, in formal attire, prepare to light the Yule Log in 1965. University President Wendy B. Libby, Ph.D., will offer welcoming remarks, and chaplains Rev. Christy Correll-Hughes and Sensei Morris Doshin Sullivan will officiate. As in the past, the Yule log will be lighted and the audience will be able to cast sprigs of greenery into the fire to symbolize letting go of past burdens and moving into a new, bright future. We will all sing “Silent Night” together by candlelight before enjoying hot chocolate and cookies in front of the flagpole. The 70th Annual Yule Log Lighting will begin at 6 p.m. on Tuesday, Dec. 4, at Hulley Tower.